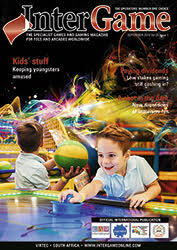 Fast approaching its 25th birthday, InterGame magazine is unquestionably the leading source of news and analysis for FECs and arcades worldwide. Each monthly edition contains operator interviews, product updates and trade show news as well as in-depth features. It regularly includes supplements on specific sectors and regions. To ensure you receive a copy for your office please subscribe here. To advertise within InterGame please email susan@intergame.ltd.uk or call +44 (0)161 633 0100.